If you are looking for something a little different in a weeping plant, then Acacia cognata ‘Waterfall’ could be worth a look. Traditionally used as prostrate ground cover plants as well as for growing over retaining walls, grafting has added a new dimension to this beautiful Australian plant. Magnificent lime to emerald green foliage and a weeping standard. Wholesalers are offering these as grafted plants at around 2m in height. The foliage flowing gently to the ground. Excellent when planted against a fence or wall, and equally at home planted as a free standing plant in the garden where it adds height colour and texture. Acacia cognata ‘Waterfall’ will flower in spring, typical yellow flowers that will attract bees and birds to the garden. Seen here planted in combination with Eucalyptus cladocalyx ‘Vintage Red’ and Dichondra repens, this is a plant that adds another dimension to the landscapers pallet. An excellent Australian native plant for smaller gardens. Acacia cognata ‘Waterfall’ is a low care, low maintenance plant once established. When planted as a weeping standard, provide a sturdy permanent support to prevent possible damage during windy periods. Once planted this is a low maintenance plant. It will require some additional water through the first summer. It will also benefit from a light mulch to help retain a cool moist root run. In containers a little native plant fertiliser each spring will be beneficial. Fertilise with a low phosphate native plant fertiliser in spring. Little to no pruning should be required other than the removal of any dead or damaged wood. Soil – Well drained loam to sandy loam. Not suited to heavy clay soils. Frost tolerant – Light frosts only. Saline soils – Not suited. Flower colour – Golden yellow. Frost tolerant – Yes, light frosts. 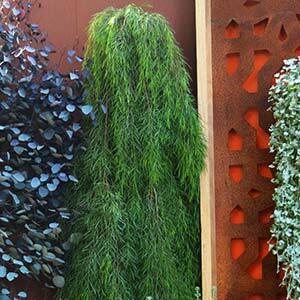 Acacia cognata ‘Waterfall’ is available from the following wholesale nurseries.